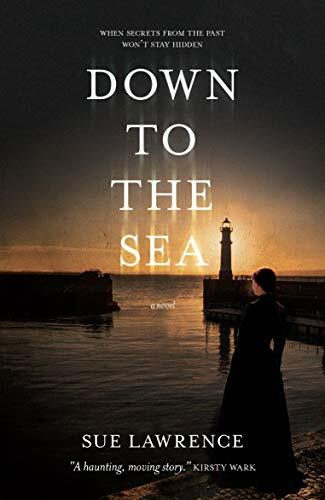 I am delighted to bring you my feature and review today for Down to the Sea by Sue Lawrence. I loved the book so much in fact that I really wanted to sit down and have a natter with the author Sue Lawrence and that is just what I did the other day. I also attended the book launch at Blackwell’s bookstore in Edinburgh. So I have some exclusive readings for you to enjoy and a superb look at the Newhaven Community Choir in action too. When Rona and Craig buy a large Victorian house up from Edinburgh’s Newhaven district – once teeming with fishing boats – they plan to renovate and set it up as a luxury care home. But something is not quite right: disturbing sounds can be heard when the sea mists swirl; their unpredictable neighbour makes it clear that the house was not always a happy family home. And their ‘characterful’ historic pile has a gloomy cellar harbouring relics from days gone by. Back in the 1890s, superstitious fishwives blame young Jessie for the deaths of their menfolk in a terrible storm, and she’s forced into the Newhaven Poorhouse. In those less enlightened times, life was often severe, cruel even, and Jessie is entirely at the mercy of a tyrant matron. But one inmate is not all she seems. Jessie begins to pick at the truth, uncovering the secrets and lies that pervade the poorhouse – and which will have profound and dangerous consequences in the future. After winning fame on the BBC’s MasterChef in 1991, Sue Lawrence has forged a career as one of the UK’s leading cookery writers. She writes a regular column for Scotland on Sunday, wrote for the Sunday Times for six years and regularly contributes to Sainsbury’s Magazine, Woman & Home, Country Living and BBC Good Food Magazine. A regular face on British and Australian television, until 2011 she was one of the food experts on STV’s The Hour. Raised in Dundee, she now lives in Edinburgh. With Down to the Sea you have two stories in one. You get to follow Jessie Mack in 1898 as she makes her way to the poorhouse at Wardie House in Newhaven, Edinburgh. Then you meet Craig and Rona in 1981 as they move into the same house to open up a luxury care home. If you read my reviews often you will know that I love a flip flop book. I love going between the two time periods and with this story the house itself is a main character. Sue Lawrence is sublime at creating a spooky atmosphere and if like me you don’t read horror or you would be worried about the book being too scary, don’t. Trust me that it is creepy but it is not overwhelming and won’t give you nightmares. Jessie Mack is a lovely character, a gentle soul who has had a tough time in life and we join her as I said in 1898, Jessie has a birthmark which in those days would signify to people that she was some sort of witch and that she could do magic. I hate spoilers so I am being careful not to give to much away, I will let Jessie tell you her own story in the book. In the 1898 parts of the book I learned so much about that time. Which just makes the book so much more for me. I don’t live far from where the book is based and I was flabbergasted that back then the folks wouldn’t have travelled into Leith or even Edinburgh city centre. I suppose if you had zero transport and you had to walk everywhere then those place would be quite a distance. Whereas now we just hope on the local buses or take the car. Here is Sue Lawrence reading from Jessie Mack’s story. In the 80’s part of the story, I loved meeting Rona and Craig as they started there connection to Wardie House. But as the past starts to bring itself to there attention will their plans come to fruition? I loved this book and it has become a true highlight of my reading year. I keep thinking about it. There are characters in the book from both time periods that are haunting me as I yearn to know more about their stories. There are a plethora of topics covered in book. If I listed them it would cause too many spoilers. But a lot of research, time and care has went into the book. You can feel that Sue Lawrence really enjoys writing and has a connection with all her characters. It is really beautiful. As you close the last page, you will feel similar to when you have had a the best Sunday dinner ever. Full, content, satisfied and happy. But longing a little later for just another helping or two. Sue Lawrence has created such memorable characters and brought to life both time periods with great accuracy and incredible writing. If you haven’t noticed by now I absolutely loved the book. I would highly recommend adding it to your TBR pile today and putting it at the top. I popped to Newhaven with Joanne Baird from https://portobellobookblog.com to meet Sue Lawrence and take some photographs. I spoke with Sue about the book and it was a super experience. We talked about how Julia Roberts would have to feature in the movie version of the book, perhaps as Martha. Sue hasn’t had any spooky experiences herself but read a lot ghost stories to prepare as research for Down to the Sea. Huge big muckle thanks to Sue for taking time out to come and meet us. I was really fan girling inside it was just and epic life moment for me. I will keep hoping and wishing for more from Wardie House and it’s owners. Thank you to Sara at Contraband for my gifted copy in exchange for an honest review. Brilliant review Kelly and your photos turned out really well.